[148 Pages Report] The automotive gearbox market was valued at USD 99.74 Billion in 2017 and is projected to reach USD 138.52 Billion by 2025, at a CAGR of 4.24% during the forecast period. The base year for the report is 2017 and the forecast period is 2018 to 2025. The research methodology used in the report involves primary and secondary sources and follows a bottom-up approach for data triangulation. The study involves the country-level OEM and model-wise analysis of automotive gearbox market. This analysis involves historical trends as well as existing market penetrations, by country as well as vehicle type. The analysis is projected based on various factors such as growth trends in vehicle production and adoption rate by OEMs. The analysis has been discussed with and validated by primary respondents, which include experts from the automotive industry, manufacturers, and suppliers. Secondary sources include associations such as China Association of Automobile Manufacturers (CAAM), International Organization of Motor Vehicle Manufacturers (OICA), European Automobile Manufacturers Association (ACEA), Environmental Protection Agency (EPA), Society of Indian Automotive Manufacturers, SAE International, and paid databases and directories such as Factiva. The ecosystem of the automotive gearbox market consists of automotive gearbox manufacturers such as ZF Friedrichshafen (Germany), Aisin Seiki (Japan), Magna (Getrag) (Canada), Schaeffler (Germany), Eaton (Ireland), and BorgWarner (US). The automotive gearboxes are supplied to the automotive OEMs. Growing demand for automatic transmission are driving the automotive gearbox market and is expected to be close to USD 40.03 Billion by 2025. A gearbox is a system that uses integrated gears with a specific arrangement to transmit the power. In automotive, a transmission gearbox is most frequently positioned at the junction point of a power shaft and provides a range of gearing to multiply the engine’s torque. The different types of gearbox used are manual gearbox, automatic gearbox, automatic manual gearbox, dual clutch transmission gearbox, and hybrid gearbox. The automatic gearbox is preferred over the others, as these gearboxes reduce driver fatigue as they eliminate the need to repeatedly use a clutch shifting gears however, increasing demand for battery electric vehicles will eliminate the need for automotive gearbox. Growing demand for the smoothness of the gear shift along with the high-performance level of the vehicle incentivize the transmission manufacturers to develop more advanced transmission systems for vehicles. How will the industry optimise the cost of automatic and dual clutch gearbox in order to push them in mid-priced and economy light duty vehicles? Is hybrid e-drive future for the automotive gearbox market? How are the industry players addressing this challenge? In which regions, companies can create new revenue pockets for short as well as long term? 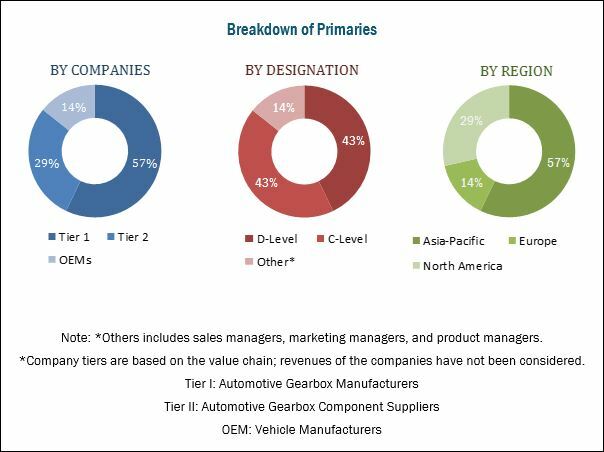 The automotive gearbox market is projected to grow at a CAGR of 4.24% from 2018 to 2025. 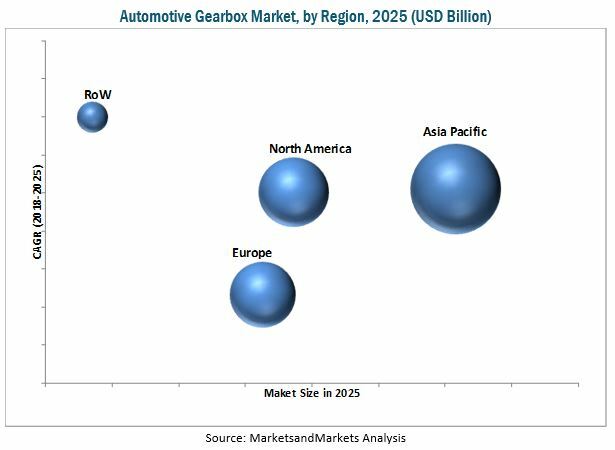 The market for automotive gearbox is estimated to be USD 103.55 Billion in 2018 and is projected to reach USD 138.52 Billion by 2025. The increasing preference for enhanced driving experience and smooth gear shifting is driving the growth of the market. Plug-in Hybrid Electric Vehicle (PHEV) is projected to be the fastest growing segment of the market, by electric vehicle. PHEV segment is estimated to have the highest growth potential in the gearbox market across the globe. Growing environmental concerns, rising fossil fuel prices, and stringent government regulations for emission have accelerated the growth of the electric vehicles market. By vehicle type, the passenger cars segment is estimated to hold the largest share of the market. The rise in the production of passenger cars globally, high demand for premium vehicles and SUVs, and expectation of high performance from personal vehicles are fueling the growth of this market. The global demand for passenger cars is larger than that for commercial vehicles and is expected to grow further in the future. Additionally, factors such as the sizeable number of luxury light-duty vehicles in Europe and North America and the increasing demand for these vehicles in the Asia Pacific region are increasing the demand for automotive gearbox. By number of gears, the above 8 gears gearbox segment is estimated to grow at the highest rate during the forecast period. This type is mostly used in commercial and off-highway vehicles which require a high degree of durability. Factors such as the development of infrastructure and increasing demand for commercial vehicles for freight transport are driving the growth of this segment. By off-highway vehicle type, the construction equipment vehicle segment is estimated to be the fastest growing segment of automotive gearbox market. Infrastructure development, especially in countries such as China and India, is supporting the growth of this market. Asia Pacific is estimated to be the largest market for automotive gearbox, in terms of value. 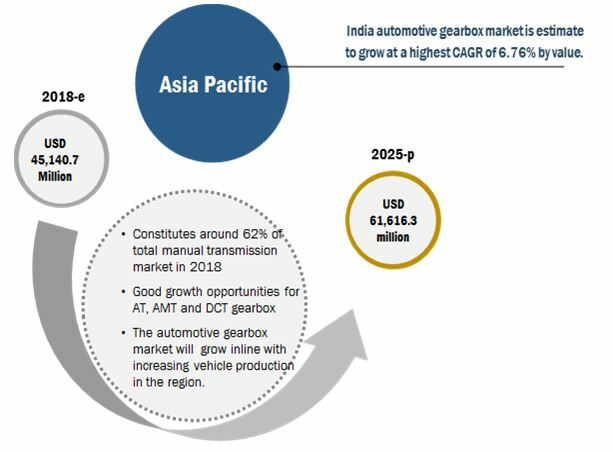 The Asia Pacific region is estimated to be the most promising market for automotive gearbox in the next five years due to strong growth in the passenger car sales year on year. Demand in the developing countries such as India and China is driving the growth of the market in the region. The increasing demand for battery electric vehicles can hamper the growth of market. Gearbox is not used in these vehicles. Instead, electric vehicles use electric motor and e-drive for the torque transmission. Some of the key players in the automotive gearbox market are ZF Friedrichshafen (Germany), Aisin Seiki (Japan), Magna (Getrag) (Canada), Schaeffler (Germany), and BorgWarner (US). The automatic transmission gearbox system in a vehicle that changes gears at different speeds without direct control by the driver. In automatic transmissions, gear selection decisions are made by an automatic control system. Instead of a manual clutch to connect and disconnect the engine from the transmission, automatic transmissions use fluid couplings or torque converters to transfer power from the engine to the transmission. Manual transmission is a type of transmission in which the gears are changed by a lever operated by the driver of a vehicle. The manual transmission transfers power from the engine to the propeller shaft. It converts and multiplies rotational speed, allowing engine RPM to remain in it’s limited optimal power range while providing a wide range of RPM to the propeller shaft; which, in turn, controls vehicle speed. Dual clutch transmission is a type of automatic transmission device in the field of automotive automatic transmission. It realizes power transmission and interruption, and shifting without power interruption through respective connection between the two-transmission shaft and two clutches. It also combines the advantages of manual transmission and traditional torque mechanic transmission so as to equip the vehicle with the same convenience and comfort with manual transmission vehicles, but better fuel economy. Automated manual transmission is an automobile transmission that combines manual transmission and automatic transmission. It allows driver control of gear selection. It enhanced gear selection features by providing either steering wheel mounted paddle shifters or a modified shift lever, allowing the driver to enter a "manual mode" and select any available gear, usually in a sequential "up shift/downshift" manner. In this transmission, the clutch operation is controlled by electronically operated devices. Where will the developments in the gearbox market will take the industry in the mid to long term? What are the adjacencies companies can leverage or explore? Which geographical markets are unexplored for automatic and dual clutch transmission in the automotive gearbox market where there is a good growth potential? 13.19 Fuji Machinery Co. Ltd.